Performance goes a long way on The Simpsons, the cast’s quarter-century relationship with their characters helping them flesh out a performance with shades no other show can call upon. “My Fare Lady,” while as unfocused as many later episodes and based partly around a forgettable pop fad, is nonetheless entertaining thanks largely to Hank Azaria’s performance as everyone’s favorite least-favorite barkeep, Moe. Azaria’s always claimed his Moe voice came from a failed Al Pacino impression (the gravelly loudness and hairtrigger temper still remain), but Moe’s irascible disreputability has grown into his own thing—the sleazy, lonely small businessman, for whom slinging watery beer to guys fleeing their own brands of unhappiness provides him with something like a family. A family that he can charge money for his company, but a family nonetheless. Tonight, when he foolishly allows Homer to man the bar so he can take advantage of some free theater tickets, only to see his establishment wrecked by the rowdy ladies night patrons Homer, Lenny, and Carl bring in, it’s an opportunity for Azaria to cut loose with Moe, turning in line after line of on-point Moe-isms that are consistently funny. What you guys did to me then for me I’ll never forget-slash-forgive. [Gratefully] Thanks a lot. [Resentfully] Thanks a lot. Oh, yeah, Marge is an Uber driver in this episode. 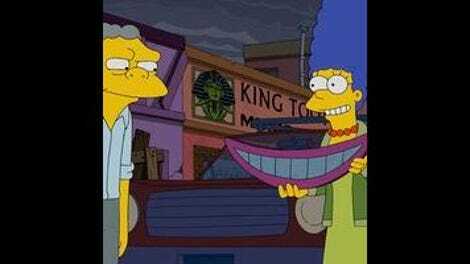 It’s called something else, but that’s the gist, with Marge’s expert kid-ferrying skills finding a home as a cabbie. 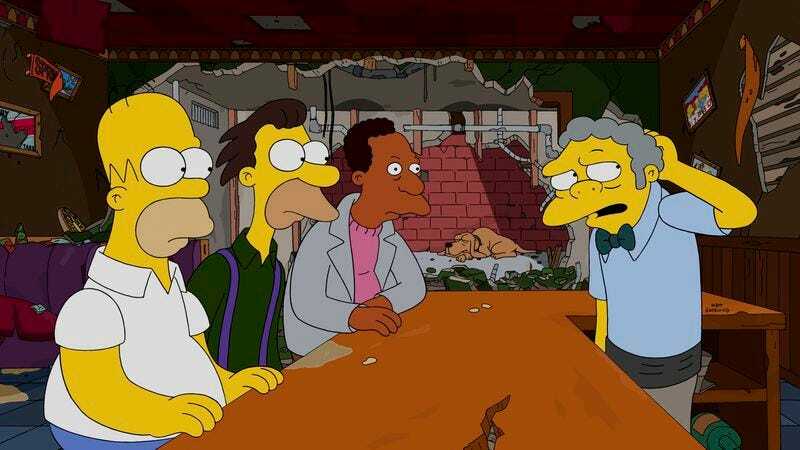 (Or, as Moe puts it when he scares of the enraged cab drivers, “Step away from the social media peer-to-peer ride share platform!”) The Simpsons can do social satire exceptionally well, even now, but there are no legs to this story and whatever pokes there are to be made at such services aren’t explored with any depth. Like a lot of late Simpsons, there are the kernels two full-length stories introduced in “My Fare Lady,” neither of which is given enough time and care to amount to an entity of its own. The Marge story, although introduced with a nicely energetic sequence of Marge showing off her driving prowess, is entirely superfluous to Moe’s story. Even the montage of her fares (including Willie, Dr. Hibbert, Disco Stu, and Dr. Nick) doesn’t deliver much before she decides she’s had enough. It’s nice that she and Moe share a moment (I’m always a sucker for Moe, despite being not-so-secretly smitten, calling Marge “Midge”), but it’s an all-too-typical case of an episode letting two unrelated story strands slap together at the end and calling it story unity. And it once again feels like the writers’ room is pulling slightly outdated “hot button” news stories off the bulletin board and calling it a plot. In the end, all is restored, with Moe back behind the bar and among his friends/customers. The fact that he almost strangles Lenny for daring to correct what kind of wood the bar top is made of—and that the fight is introduced by Moe conceding, “The best way to get along with most people is to be kept behind a two-foot length of solid oak” only means that things are just as they should be for the guy. I’d stop harping on this if the show didn’t keep making the same choices, but for a Simpsons episode to be more than just the thinly motivated parade of gags a lot of later-day episodes are, they need time to expand. The cute 8-bit video game couch gag tonight (from Australian animators Paul Robertson and Ivan Dixon) was fun (I’ll leave it to the more savvy among you to pick out the references). But it was also two minutes long. Follow that with another minute devoted to Homer’s Jetsons dream sequence—also cute but nothing special—and that’s a lot of time stolen from the episode proper. Especially with an episode devoted to two dueling A-stories. Only the fact that all the performers sounded like they were giving their all to their roles elevated “My Fare Lady” to the extent that it did. The Jetsons gag, like a lot of jokes this season, suggests that there is a lot of unused Futurama material still kicking around. And that’s Christopher Lloyd bringing back Taxi’s Jim Ignatowski. No reason for it, but nice to hear him all the same. Moe’s extended limbering-up routine before the first pour of the day is a nicely constructed piece of animation. Plus, there’s always time to draw out a joke, with Azaria’s elongated “Whaaaaat?” at seeing the bar trashed held just long enough. That the ladies’ night promotion breaks down over two rival book clubs (they’re reading exquisitely named The Heaven Lovers Club) is a funny gag, especially since the criticism that sets it off is so mild (“I thought it was a little slow”). Any resemblance to Internet comment sections is only in said commenters’ minds, I’m sure. Plus, the way that one lady whipped out the hairspray blowtorch? That escalated quickly. Tress MacNeille’s obvious Elaine Stritch homage was spot on—Stritch was indeed, “the brassiest piece of sass in this whole damn town.” Shame about the defibrillator joke, which seems like something that could have been cut out after she died. How do you fit such brilliance in such an ugly, ethnic head? What profit a man if he gain the world and lose his soul? Seriously, Smithers, I need an amount in round dollars. People say you can catch more flies with honey than with vinegar. I say with flytraps.